Not many candy brands have had to release a strange statement like this, but 2016 is just full of surprises for Tic Tac, ain't it? 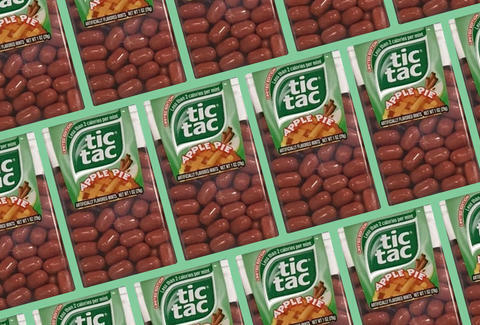 In more pleasant news for the tiny, minty brand, the company's released apple pie-flavored Tic Tacs this month, according to the supermarket experts at The Impulsive Buy. While flavors like orange and mint are available year-round, the pie version is (thankfully?) a seasonal option. The reddish-tinted mint is a strange flavor choice considering that actual apple pie is not typically used to freshen breath. But maybe that all changes starting right now. The odd flavor makes more sense if you've been keeping up with the brand, as this is not its first foray into crazy Tic Tacs -- it recently dropped a Mixers line with cherry cola and peach lemonade mints. Perhaps the brand will soon truly get into the fall spirit and release a pumpkin spice flavor. After all, everyone else is doing it. Lee Breslouer is a senior writer for Thrillist, and once he pops, he can't stop. Follow him to minty tweets @LeeBreslouer.